Throughout the year, CRRC organizes training courses, seminars and lectures on a variety of social science topics, attracting both local and foreign experts as speakers or trainers, locally and regionally. Progress in the social sciences depends on people who have the skills to critically create, read, evaluate, and criticise research. We host regular workshops designed to boost the methodological skills set of local researchers and providing hands-on opportunities to use relevant statistical software packages. Traditionally a weakness in the Azerbaijani educational system, methodological skills form the foundation for understanding society around us in a systematic and rigorous way, as well as how to critically evalute existing research. Our workshops give researchers a to learn how to design research, formulate a research question, and collect and analyse both qualitative and quantitative data, help to build the quality of social science research carried out in the country. More broadly, we look to build a culture of respect for methodology in research in the country by encouraging the development of these skills. CRRC draws researchers, public administrators, and other policy practitioners from all three South Caucasus countries to discuss and debate on key public policy issues in the region and cross-border trends in policy formation, encouraging interdisciplinary dialogue among researchers and practitioners. The center provides information and educational assistance to emerging public policy institutes, and providing a variety of networking opportunities for researchers and policy practitioners. 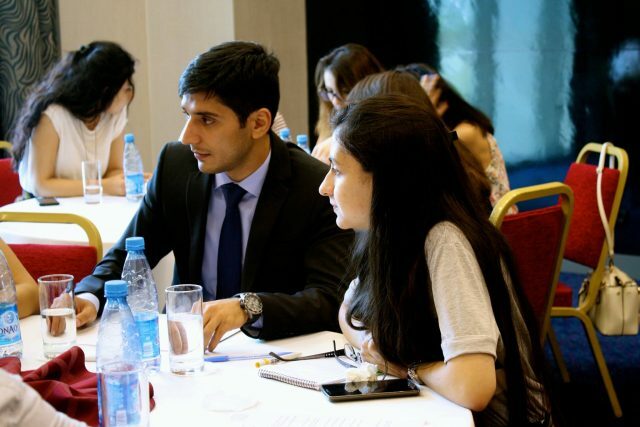 In addition to our formal events, CRRC Azerbaijan hosts regularly Work in Progress discussions, where researchers at all levels are invited to present their research, either early or late stage, and invite feedback from fellow researchers. These events never fail to provide lively discussion, on both methodology and content!